There’s an old, cringe-worthy observation that asks: what do you call the medical student who graduates at the rock-bottom of his class? Answer: Doctor. The lack of confidence this instills can be easily transferred to any kind of educational model that confuses seat time and marginally passing grades with true learning. It is appalling that it’s also commonplace, all the more so when we consider the many decades of “conventional wisdom,” we’ve all suffered through, during which we were paternalistically patted on our collective heads and told, “this is how it’s always been done.” I never did find this reassuring. We’ve been doing it wrong for a long time. Fortunately, all around the world, brilliant people are figuring out how to do it right. 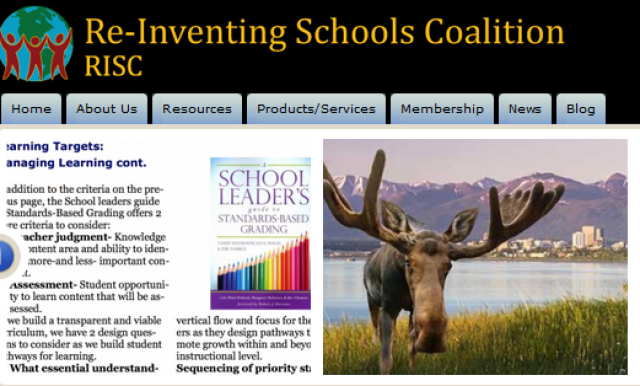 One group of such people has joined forces as the Reinventing School Coalition (RISC). Their seeds were first planted in Alaska, where they found dramatic success with a radically different concept – they took a good hard look at the decrepit cells and bells model — so stuck on seat-time, sterile texts and a rigid, vague, conforming grading systems model — and tossed it out the window, then started over. What they built has proved phenomenally successful, improving school-wide performance well into the double digits annually, over and over again. •	Putting student success at mastering the material first. Seat-time became irrelevant. •	Carefully tracking very specific skills throughout a student’s education. •	Continually recalibrating their approach to teaching, based on what works. •	Establishing a Professional Learning Community, where staff frequently exchange notes and help each other improve. •	Recognize that every student proceeds at a different pace, and learns differently, and finds different experiences inspiring and enlightening, and needs their education to adjust accordingly. •	Recognizing that the more students are given ownership over their educational planning, the more engaged they become. What they built far surpasses the old model. When done right, this approach empowers all students to truly master what they study, and to tailor their studies to make them meaningful and engaging. Their work in Alaska was so impressive that it started to spread across the country, while evolving into the RISC. The down side to adopting their approach is that it’s an immense amount of work, a bit complex, and as a result, I’ll admit, intimidating. But on the up-side, to start with, what’s the alternative? Continuing mediocrity? To make this a little easier, they’ve pulled together a pretty extensive bookshelf that we all can draw from in replicating their successes. In addition, they’ve made themselves available for consulting and assisting any brave souls who are up to the challenge.